With the national polls deadlocked, nine battleground states appear poised to determine the next president. Here's the math: Obama starts with 237 electoral votes from the states won twice by Kerry and Gore, minus Wisconsin and plus New Mexico, where resurgent Democratic support among Latino voters has moved a once competitive state into the Democratic column. Romney starts with 191 electoral votes from the states won by McCain, plus Indiana—where Obama's historic victory wasn't underpinned by durable demographic changes. So what battleground states are best for Romney or Obama? Several states are pretty tough to distinguish and I'll probably flip on a few of these by Election Day, but here are the nine battleground states, ranked from most to least likely to flip from Obama to Romney. Romney enters early voting with a clear advantage in the Tar Heel state. So far, Obama trails in all but one poll conducted entirely after the first presidential debate, with Romney holding an average lead of 3 points. But even though Romney is indisputably better positioned in North Carolina, it's worth remembering that the race is still pretty close. PPP, Rasmussen, and YouGov/Economist show Romney performing an average of about one point worse in North Carolina than Florida, and the same three polls don't show evidence of a significant shift in Romney's direction after the first presidential debate—with Rasmussen and YouGov/Economist not showing any evidence at all. The state's demographics all but ensure a very tight race, with the state holding huge numbers of white evangelicals, African Americans, and northern professionals. Although Obama will lose a few '08 swing voters, Obama will make up ground by capitalizing on favorable demographic changes. In the absence of more conclusive data, an Obama victory remains conceivable in a state decided by turnout and where the Obama campaign has a large ground operation. As early voting gets under way, pay careful attention to see whether Obama has any chance of replicating the historic African American and young turnout necessary for Obama to capitalize on favorable demographic trends and overcome slight losses among the state’s sliver of swing voters. But for now, Romney has the advantage; the outstanding question is whether Obama’s vaunted ground game can squeak out a narrow victory. That makes North Carolina tougher for Obama than the other states on the list, where the president doesn’t necessarily need to thread the needle to get a narrow victory. After all, Obama has held a modest lead in just about every other battleground state at various points this year. It's also worth considering North Carolina in comparison to the states on the other end of this list. Romney leads in North Carolina by about the same amount that Obama leads in a state like Nevada or Iowa. It's helpful for partisans to consider these states with their counterparts in mind—Democrats think Nevada is a lock and Republicans believe North Carolina is a lock. Realistically, the favored candidates on either end of the list hold a big edge, but their opponents retain narrow paths to victory. No state has moved more clearly in Romney’s direction since the first presidential debate than Florida. In 2008, Florida was 4 or 5 points more Republican than the rest of the country, so it’s not surprising that it’s tilting slightly Republican in a tied national race. There are hints that Obama's struggling with Latino voters and Democratic unity—problems that the Obama campaign would seem positioned to correct over the last few weeks, at least to a certain extent. Despite Romney’s gains, Obama is only behind 2 points with leads in three of the nine post-debate polls, so the state remains quite competitive. Nonetheless, the state discernibly tilts toward Romney (especially given its electoral history), unlike the next two. If Romney wins Florida and North Carolina, he'll hold 235 electoral votes. He does not possess a realistic route to the presidency without the support of both states. Perhaps the two states most emblematic of Obama’s “new coalition” of upscale whites, minorities, and young voters are now the closest contests in the country. A simple polling average puts the race within one point on either side, with Obama leading by 1.1 points in Colorado and Romney up by .5 in the Commonwealth. Who has the better shot in Virginia or Colorado? There are rumblings about the Obama campaign having issues in Virginia, although insider reporting doesn't deserve too much credence without real changes in campaign behavior (Obama is in Fairfax tomorrow). Unlike Colorado, Virginia is essentially a turnout game. Obama is all but assured to generate a large African American turnout and a strong showing in the D.C. suburbs, but Romney will rack up huge margins in western Virginia. The most recent NBC/WSJ/Marist poll shows Romney making big gains in western Virginia, where Romney now leads by 22 compared to 11 in their pre-debate survey. And the Obama campaign appears to recognize that they've lost most of the persuadable voters in this part of the state, since they've cut their advertising in the Roanoke media market in half. There are a few true swing areas in Virginia but far fewer than Colorado, where the election will be decided by persuadable voters in the Denver suburbs and other Front Range communities like Ft. Collins and Greeley. Since a strong performance in affluent suburbs is probably sufficient for Obama to win Colorado, but prerequisite to a victory in Virginia, I’m inclined to give Colorado the slightest nod, at least for now (long time readers know that I've flip flopped on Colorado v. Virginia throughout the year... as recently as last week). 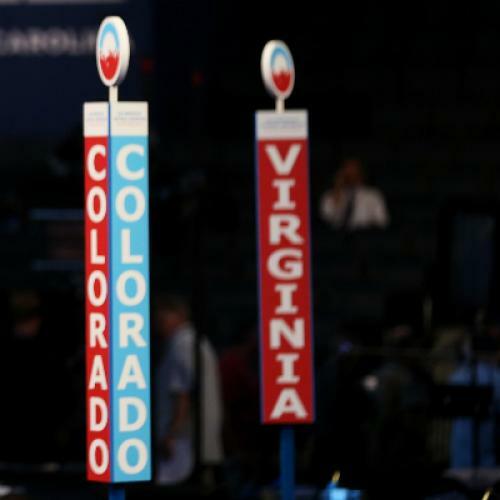 The tiebreaker: Obama won Colorado by 9 points in 2008, but only won Virginia by 6. Romney would hold 257 electoral votes if he could win both Colorado and Virginia, as well as Florida and North Carolina. If that occurred, Romney would only need Ohio or any other two of the following states. Conversely, it would be very difficult for Romney to overcome losses in both Virginia and Colorado, which would give Obama 259 electoral votes before getting to his strongest states. Given Obama's strength in the Midwest, it would be very difficult for Romney to overcome a loss in Virginia, even if he won in Ohio. But if Obama just carried Colorado, a Romney win in Ohio and New Hampshire—where the polls suggest that Romney has made gains—would be sufficient to block Obama's "Colorado path" to victory. There haven’t been many New Hampshire polls since the first debate, but the ones we have hint at big movement in Romney’s direction. The three post-debate polls show a tight race, with PPP showing Romney up 1, Rasmussen showing Obama up by 1, Suffolk showing a tied race, and ARG actually showing Romney up by 4. If confirmed, New Hampshire would be as tight as Colorado and Virginia. But the state’s Democratic-lean over the last two elections and Obama's 6 points in the pre-debate polls are enough cause to presume that Obama holds a better chance in New Hampshire than Colorado or Virginia. The Romney campaign hasn't made significant investments in the state, either. Of all the states, New Hampshire is most likely to make big moves between now and November, simply because of the uncertainty involved in the relatively limited set of data. Tiny New Hampshire can't play a decisive role in most electoral scenarios, but it holds the key to Obama's "Colorado path" and would also allow Romney to win the election if he lost Ohio and carried Wisconsin. While some believe that Romney would be better off pursuing alternative paths to victory, Ohio still looks like Romney’s path of least resistance to 270. Obama’s 1.8-point lead is meaningful, but not insurmountable in a Republican-tilting state where the Democratic candidate doesn’t exceed 49 percent of the vote. It’s also a smaller lead than Obama’s edge in Wisconsin, Nevada, and Iowa, where an average of polls shows Obama ahead by at least 3 points. The case for moving Ohio further down the list starts with the assumption that Obama actually leads by 3 or 4 points in the Buckeye State, since pollsters contacting cell phones like SurveyUSA, NBC/WSJ/Marist, and CNN show Obama leading by 3 to 6 points, while the automated surveys without cell phones (minus PPP) all show an Obama lead of 1 point or less. But even if one accepted that Obama was up by 3 or 4 points in Ohio, that would be about the same as the state's further down the list. Ohio winds up at #5 because it traditionally tilts-Republican, Romney leads in some polls, and Obama isn't at 49 percent—unlike Iowa, Wisconsin, and Nevada. If Romney won Ohio, North Carolina, Florida, Virginia, and Colorado, he would hold 275 electoral votes—enough to win the presidency. But if Obama won Ohio, Romney would need to win both Iowa and Nevada or Wisconsin—and that's a difficult, but not completely impossible, task. Obama holds a modest but clear lead in three states with a strong case to top the list. Obama only leads by an average of 3.2 points in Wisconsin, but Obama has exceeded 49 percent of the vote in all but two August surveys (including each of the 6 post-debate polls) and Obama won the state by 14 points in 2008—more than any of this year’s battlegrounds. And while the campaigns kept Wisconsin on the backburner for most of the summer, it’s now home to three of the top ten most saturated markets. Iowa only voted for Obama by 10 points in 2008, but the polls make a strong case for Iowa’s place in the top spot. Four polls have conducted post-debate surveys in Iowa and each pollster has also surveyed at least 6 other battleground states. Remarkably, all four pollsters showed Obama doing better in Iowa than any other swing state, including Wisconsin. Romney’s case in Iowa starts with a GOP voter registration advantage and relatively few polls to confirm the 8-point lead found by NBC/WSJ/Marist. Romney has only led one no-name poll of Nevada, a state that Obama won by 12 points in 2008. And over the last few months, Democrats have amassed an ’08-esque voter registration advantage in Clark County that would be very difficult for Romney to overcome without an exceptional performance among registered Democrats and independents. Just for good measure, Nevada polls have a history of underestimating the strength of Democrats—especially among Hispanics and in Clark County—and there are signs that the polls might be struggling with the same issues in 2012. There's a strong case for each of them and the polls show a 3 point race in all three states, but Iowa goes seventh because there isn't as much data to support a highly confident assessment. Ultimately, the case for Iowa boils down to the NBC/WSJ/Marist poll and although it's very tantalizing and hints at a big Obama lead, I'm deferring to the added confidence of more data over the chance that Obama has a much larger lead in Iowa, at least for now. The GOP voter registration advantage is also a powerful reason to be more cautious about Obama's chances, since Romney is faring well among independents nationally. That leaves Wisconsin and Nevada: two states where Obama almost always leads in the polls with nearly 49 percent of the vote, where Obama did very well in 2008, and where Obama looks well-positioned in post-debate polls. Wisconsin doesn't have a big strike against it, except perhaps that the ad spending hints at a closer race than the polls. But with the polls and history close in Nevada and Wisconsin, Nevada's voter registration numbers make it Romney's toughest state. The Democratic surge highlights the strength of the state's party machine and clarify Romney's tough math in a state where Democrats hold a huge advantage in a county holding 70 percent of the vote. The tiebreaker: Nevada polls have tended to underestimate Democratic candidates in recent years.